If you love taking your dog out for a ride in your car then you will want to find a vehicle that is perfect for him to get around in. So what features should you look for in order to make him as comfortable as possible? Getting some dogs into the car can be a hassle, especially if they are big and don’t particularly like travelling in this way. A good feature to look for in this case is a low load floor. This will allow him to jump in or get lifted in a lot more easily. This will also make life a lot easier for you if you plan to let him travel in a crate or kennel of some type. Over time he should get used to the idea of hopping into the car and he might start thoroughly enjoying it as well. However, for the first few trips when he is somewhat nervous a low load floor will allow him to get into the vehicle without any sort of fuss. You certainly don’t want the trip to start in a bad way with him going into a bad mood and you getting all flustered with the effort of lifting him in. While a lot of pooches love nothing more than sticking their head out of the car window, not every driver likes their pet to do it. Sure, it looks cool and the dog loves it but it can also be dangerous for them too. 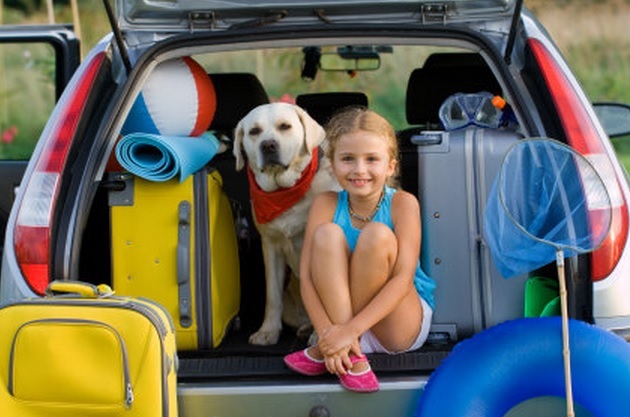 Of course, if it gets too hot inside the vehicle then this is also bad news for your pet. An ideal solution for many is to get a car with a convertible roof. Your canine passenger is sure to love it when you lower the roof down and he feels the wind blowing through his fur. This is one of the most stylish ways of travelling in a car with a dog and he is going to get lots of adoring looks from other people on the road when he gets around like this. Just be sure that he is safely positioned in the car before you lower the roof while travelling at speed. While the last point sounds fantastic, not everyone wants or can afford a convertible car. This means that the next best point is to get a car with a cool sunroof on it. This will bring a number of benefits, such as letting light and fresh air flood in to the vehicle on hot, sunny days. If you can get a car with a sunroof on it then you, the dog and everyone else who goes in it will feel the benefit. This will make sure that he doesn’t get too hot or get tempted to hang his head out of the window when you don’t want him to. Since we have looked at the issue of heat inside the car it is worth also thinking about the need for air conditioning. If you have this then it means that you don’t need to roll down the windows on hot days, cutting out the risk of him sticking his head out. Dogs can suffer badly when it gets too hot, so keep an eye on him and turn on the air conditioning when he seems to be getting too hot. If you take him out in a small car then this isn’t necessarily a bad thing, provided that you can make some adjustments. You might still want to put him in the boot and use one of the special boot liners for dogs. However, in addition you could make sure that the car comes with rear seats that fold flat down. In this way, you can create a lot more room for him when needed. Big hugs to Roisin for this excellent Guest Post. We hope she’ll be writing for us again soon! You’ve Got Some Truck Driving Experience under Your Belt — Now What?